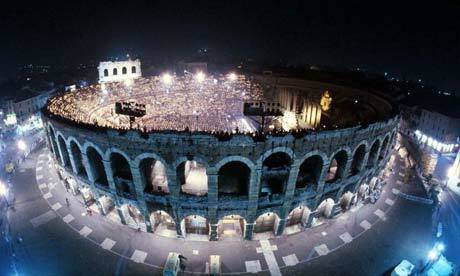 Because I went to Verona when I was only 12, the only thing that I remember is the Roman ampitheatre, one of the best preserved that exists in the world and one that is still used for concerts today. What I remember is that it was spectacular! Built in 30 C.E. outside of what was then the city in pink and white Valpolicella marble, it was almost destroyed in a 1117 earthquake. The Renaissance saw a revival of its use as a theater due to its excellent acoustics, and it has had a continuous summer season of concerts since 1813, except during the world wars. No electronic sound system was used until 2011, although the rock concerts of many famous bands probably used their own speakers -- Pink Floyd, Simple Minds, Duran Duran, Deep Purple, The Who, Dire Straits, Mike Oldfield, Rod Steward, Sting, Pearl Jam, Radiohead, and Muse.